I can’t tell you how many times I have heard “How do I get rid of these wrinkles?” in my studio. The wrinkle thing has been on our radar forever. It’s not just the quest in 2013 to be wrinkle-free but the pursuit of a complexion that is even-toned, dewy and smooth. To give you a quick skin care 101, when we are young, specialized cells called melanocytes create a steady flow of pigment that reaches the skin’s surface, this gives you that even toned skin. When we age, melanocytes decrease and tend to cluster, so pigment is spread less evenly. Have you noticed how many brightening serums, creams, lotions are out on the market now? From the drugstore to the department store it can be extremely confusing on what product is the best for brightening your skin. Women all over the world are consumed with finding products that help protect against internal and external stressors that cause skin discoloration, natural ingredients that aid in inhibiting melanin production and products that promise to brighten and give your complexion a glow. 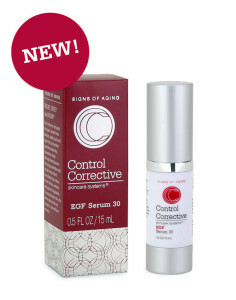 Enter the product that many of my clients are using and raving about, it’s called EGF 30 by Control Corrective. EGF stands for Epidermal Growth Factors which are proteins that regulate cellular growth, proliferation and differentiation under controlled conditions. The growth factors grow in the media and then are extracted once purified and compounded. EGF does not contain stem cells, this serum is derived naturally from a fresh, single fibroblast cell, then finely processed in an FDA registered biotech laboratory. The next question you might have is “Is it Safe?” Yes, safe and efficacious for all, growth factors are naturally found in the skin and are compatible for all skin types. So how does this EGF 30 work? It penetrates to the deeper layers and regenerates aged, depleted and damaged skin cells. They stimulate biochemical pathways that promote skin tissue repair and are also credited with promoting the formation of collagen and elastic fibers two words we LOVE to hear. Key active ingredients include: Mustard Plant, Epidermal Growth Factors, Watermelon Extract and Vitamin C.
Client: 68 years old. Results after 1 month of EGF Serum 30 use. Before and After photos are not retouched. Reduce the appearance of fine lines, wrinkles, age spots and even our your pigmentation with this powerful serum. Can’t wait to hear what products you are using to brighten and lighten your skin!!! Leave a comment here or on Facebook.